What Photography Pricing Guide is Best? One of the most common questions I get from readers is what the difference is between the various pricing guides out there, such as Easy as Pie, Creative Pricing & Packaging, my own free pricing guide, and others. Do you need to buy Easy as Pie? Or is my free pricing guide series enough? Or is there something else out there that is better? Each of them have value, but they all significant differences and they aren’t all applicable to everyone. Instead of reviewing each guide separately, I thought it’d be helpful to do a mini-review of each of them and then compare them to each other. They don’t all directly talk about pricing, but each one of them is written with the goal of helping you increase your average sale, so they all are related in that way. So this post is here to help you figure out which pricing guide is best for you so that you can stop wasting money on products that are not relevant to you and make sure that you’re getting exactly what you need to make more money in your photography business. There’s a few things you should know about me first before diving in, since so many reviews out there are biased and I want you to know what my bias is to keep things completely transparent. First, about a year ago I stopped pursuing portraits in order to spend more time writing this blog. I’ve always loved weddings, I only did portraits for the money, but I found that helping people grow their businesses and reach their goals made me come alive. I didn’t actually read either of the portrait guides until AFTER I had stopped pursuing portraits, but I had already moved to doing in-person sales (read about my in-person sales process here, although it’s nowhere as detailed as what you’ll find in some of the guides below) and had come to some of the same general conclusions that you’ll read about in these guides. So I feel I can speak to how well these portrait strategies will work or not. Second, if you use the links below to buy the products, I receive a commission. I do this to make up for some of the portrait income that I lost when I stopped pursing them to blog here more. So if you use the links below, you’re helping me to keep writing the site and reviews like this, so I highly appreciate it. It’s a great way to say “Thank You” for the information you read! So thanks for helping me to keep doing what I love! Phew! Now that you know exactly where I stand, let’s talk about the various guides. Easy as Pie by Served Up Fresh is one of the most well-known pricing guides out there for portrait photographers, and many people swear by it. In fact, if you go looking for reviews, you’ll find tons of raving reviews about it online from people who have used it and multiplied their profit many times over. What will you learn in Easy as Pie? You’ll learn basic product pricing and sales for a traditional portrait business that offers several products but focuses on packages as a main way of making your income. You’ll see concrete pricing recommendations, such as how much you should price an 8×10 in order to average $X per session and it talks about getting from where you are now to where you want to be when using her pricing. You’ll learn how and when to raise prices, and how to avoid the “cheapies” who want everything for nothing and why they aren’t your target market. There’s also a discussion about portfolio building discounts and what’s appropriate and what’s not, and she lists the vendors she uses. Easy as Pie does not go into how to adjust pricing for your market vs. what her market is like despite giving specific price ranges for specific products. It also does not discuss sales meetings or online galleries. It does, however, give you an advanced pricing strategy in addition to the package model that can be done once you’ve got so many clients that you don’t have to worry about getting enough business. Easy as Pie is sold as a pricing guide to help you price your products. Since I’ve got a math degree and have know pricing inside and out, I’m pretty critical of how accurately this is being taught. I feel like there are some glaring weaknesses the Easy as Pie pricing guide’s math that put a damper on how much I can recommend the guide. First, it doesn’t take any of your business expenses or taxes into account at all. So when you’re thinking about how much you want to make, there’s no talk of how expenses come into play at all EXCEPT when talking about the Cost of Goods Sold (COGS). So none of your operating expenses (gear, insurance, business licenses, computers, education expenses, and everything else you need to run a business) are included, and even worse there’s no talk of how taxes will be taken out or how to factor it in. So if you want to make $5000 per month doing photography, you’d simply use that number and then at the end of the year after expenses and taxes are taken out you’d be well short of that goal. So honestly, I don’t think it’s a great product in terms of showing you exactly where you need to be in order to price your photography accurately. On the other hand, if you don’t rely on your photography income and you don’t like getting into all the nitty-gritty pricing details, it’s a great simplistic pricing guide that will get you started and growing. Her template for creating packages is solid and is set up to help people want to upgrade to some of the higher-priced package. It also does a great job of helping people to have the confidence to start charging adequately for their photography and stop giving away their services for little or nothing. It puts a lot of weight on supply and demand, and less weight on how much you want to make when all is said and done. Is Easy as Pie for you? 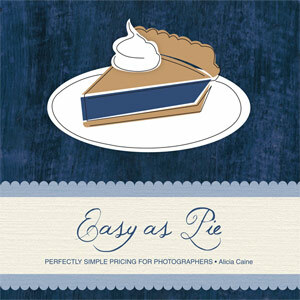 Easy as Pie is a great choice for photographers who don’t have to rely upon their photography income and simply want someone to tell them how much to charge and to help guide them as they grow their business without digging into the numbers too much. It’s good for people who want a template for creating packages that follows a more traditional portrait package model and encourages people to buy larger packages. It’s a great guide for someone who wants their hand held as they go from being an artist to a professional but isn’t worried about all the details too much yet. If you’ve never put any thought into what you charge and just kind of come up with your prices off the top of your head, it’s a good guide to get you started in the right direction and will certainly bring you much profit. Easy as Pie costs $350. No discounts are currently offered. Click here to learn more or buy now. 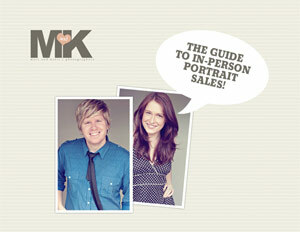 The Guide to In-Person Portrait Sales by Matt + Katie is a brand new product about portrait sales that seriously rocks. Matt sent me a free copy to check out a few months ago and I’m very impressed with it. It tells you exactly what they did to make over a quarter of a million dollars in 2010 in a market that was over-saturated with cheap shoot-n-burn photographers who charged hardly anything for a session and a disc combined. I know many of the readers of this blog suffer from the same kind of market. What will you learn in The Guide to In-Person Portrait Sales? The Guide to In-Person Portrait Sales is not a pricing guide, although it does talk about how to price and sell your products to make your average desired amount of sales and has a brief chapter on pricing. It’s a complete and robust guide to sales that tells you exactly what to do to optimize the entire sales process, which is incredibly valuable, but doesn’t talk about how you get the numbers you need to figure out what your average sale target should be. You’ll learn when to use packages vs. when to do a la carte ordering (and it varies depending on if you are doing in-person sales or online ordering), how to sell more through offering less, what products they suggest selling, and how to set up a selling area that helps you sell the most (although no studio is required to use their methods). You’ll also learn exactly how to conduct a sales meeting with a script that you can use and modify to sell your own products as well as the psychology behind why they say exactly what they say. While they teach about how to do in-person sales, they also include a free add-on bonus guide about how to adapt the principles to online galleries. Finally, they do a great job of empowering you to have the confidence to sell, even if the thought of sales scares you and makes you get all weak in the knees. I love this guide. It’s well-thought-out and extremely detailed in exactly what to do during a sales session and why. It’s versatile for any kind of in-person sales session (regardless of whether or not you have a studio) and their online gallery add-on is useful for taking these principles and applying them when you can’t do sales in-person. While it can apply to any kind of portrait business, I think it would work best for photographers who are looking to have a boutique model and truly serve the high-end type of client who value photography. Because it’s so detailed, I’d say that this is good for photographers that are both new to in-person sales as well as for those people who have done in-person sales but want to see their profits increase. They offer videos as well as the written guide. While I love their sweet Aussie accents and feel like the videos help to make this more personal, I don’t think the videos are quite as detailed and aren’t necessary if you read the guide. Is The Guide to In-Person Portrait Sales for you? If you’re a portrait photographer who wants to make more money doing in-person sales, whether or not you are already doing in-person sales, this guide is certainly for you. I believe this is the best model out there for maximizing your portrait sales, although it isn’t based upon a traditional package model. It’s also great for people who aren’t natural “salesman” who want someone to hold their hand through the selling process to make it less scary and more natural. Guide + Videos for $250, or $150 for just the guide or videos. The Modern Tog readers get 20% off anything EXCEPT the package with Skype Coaching through 6/28 with coupon code: mkmoderntog Click here to learn more or buy now. Creative Pricing & Packaging was the first photography-related e-book I ever purchased, and it has paid for itself over and over again in my business. If you’ve been around this site very long, you’ve probably heard me raving about it again and again. This is because it significantly increased my wedding package average without any other price changes, just package changes. Pretty awesome. 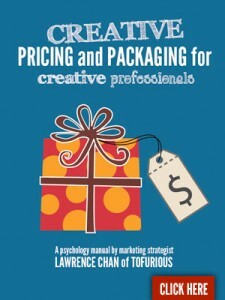 What will you learn in Creative Pricing & Packaging? Again, this e-book is not going to walk you through pricing even though it says pricing in the title. You are going to learn about the psychology of choice and how to make your clients choose the package you want them to choose most of the time simply based on how you set it up. You’ll learn about using incentives, how names & sizes can affect choices, how to keep people from simply itemizing your offerings and comparing them to what other photographers offer (we know that there’s a huge difference between a press-printed album and a full photographic flushmount album, but our clients may not), and all sorts of other psychology that will help you create better selling packages. It does not talk about any numbers or how to sell. It only discusses using packages vs. a la carte offerings, and all that revolves around that. 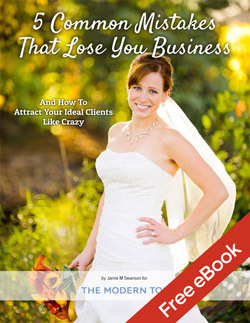 This e-book is a great resource that I love as it makes you think and gives you the information, but it still leaves room for you to figure out what works best for you and your clientele. There’s no templates for building packages, but it gives you everything you need and WHY in order to do so, and I honestly think it’s worth way more than it sells for currently. It also comes with Lawrence’s wedding pricing guide, but I bought the book back when it wasn’t included, so I can’t speak to the usefulness of that or not. I also love all the relevant examples that he gives that you see other major brands using, which helps you to understand the why behind the principles you’re learning. Is Creative Pricing & Packaging for you? This is relevant to both portrait and wedding photographers who are wanting to use packages to sell their goods and services and wants to know how to make people choose the package they most often want to sell. Creative Pricing & Packaging costs $65. The Modern Tog readers get 20% off through 6/28 with coupon code: summer Click here to learn more or buy now. How do these differ from the Free Photography Pricing Guide Series here on The Modern Tog? The above pricing guides are more like pricing and sales strategy guides. They give you the tools and tips you need to increase your average sale to your desired amount. They discuss how to create packages or sell A la Carte and present those products in such a way that your client is compelled to buy. They don’t go into more than the basics (if anything) regarding the math behind the pricing strategies. 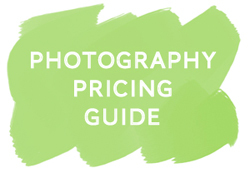 This is where the free photography pricing guide series comes into play. The pricing guide starts with how much you want to take home as a paycheck from your work and tells you exactly how to take everything into account (including taxes and expenses) to make that much. It will give you more accurate average session fee/wedding package targets, and will take your time into account when pricing products instead of just using some random multiplier. It doesn’t, however, tell you the best strategy for getting there, and without strategy you’ll never make it to your goals. So the pricing guide series is really a tool that works hand-in-hand with any of the products above. While it’s a free pricing guide series, I highly recommend purchasing the workbook that goes with it (requires Excel). This will make your pricing a breeze compared to doing it all by hand, and will allow you easily adjust things to see how that changes the numbers. Right now, you can get the pricing guide for 20% off through 6/28 using coupon code: pricingcompare Click here to learn more or to buy. So what product should you buy? No matter what guide you decide to use, I recommend using my pricing guide to determine an accurate average sales goal. If you’re primarily a wedding photographer and don’t shoot many portraits, I’d get Creative Pricing and Packaging hands down. For portrait photographers, I most strongly recommend The Guide to In-Person Portrait Sales because it’s way more detailed than Easy as Pie and I think it’s got a lot more information for much less than half of the price of Easy as Pie. I honestly think it’s the best plan for success in sales that I’ve seen, and I’m doing everything I can to think about how I can apply this to my wedding business as well. It works on more of a hybrid A la Carte / either-or model that I think is best suited for boutique businesses, which is what most of us have to work towards to be truly profitable to the point where this can be our full-time business. This is not to say that Easy as Pie is not valuable. If you’re set on doing packages and just want someone to hold your hand through all of this, then this will lay out a clear package model that you can simply push your numbers into. However the calculations in the guide are very simplistic and don’t take expenses or taxes into account, so go into it knowing that it’s more basic than the other two guides. The alternative to Easy as Pie for portrait photographers who want to do focus on packages is Creative Pricing & Packaging. It won’t go through the pricing at all (you can do this with my free pricing guide) but it will tell you how to set up amazing packages that sell like mad. Seriously awesome. Go buy it before Lawrence realizes how much more he could be selling this for and raises the price. Have you used any of the pricing guides above? If you’ve used any of the pricing guides above, leave a comment below with your thoughts or reviews about it. Would love to get even more feedback and results from photographers who know and love the products!